Life Between Pages: 漫画大好き ... I ❤ manga! 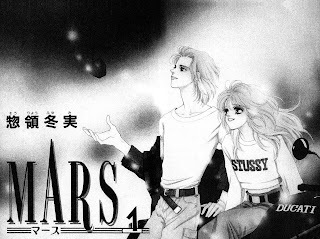 Ever since a few weeks ago when I picked up Mars by Fuyumi Soryo at the village library, I've been completely in love with manga. Since then, I've read five more volumes of Mars, five more of One Piece by Eiichiro Oda, and my amazing friend Jess handed over a massive stack of her own collection for my perusal (including several volumes of Shaman King, some Naruto, The Good Witch of the West and various others – you rock, Jess!) I can't get enough of the stuff! What I think I love about manga is the pure Japanese artistry and humour which, I know, is a given considering it is Japanese (I hear a lot of 'duh's!). But you know what I mean; it just has a certain charm that you can't find with any old comic book or graphic novel. As much as I would love to enjoy reading Spiderman, Batman or even Buffy (I've concluded that the Season 8 storyline is too out-there for my taste... even by Buffy's standards! ), there's nothing that I find particularly appealing about them. It's also really interesting that a lot of anime series' have started out as manga (like One Piece, as you can see). So there's no shortage of opportunities to see your favourite characters both illustrated and animated. But, then again, there's not exactly a shortage of adaptations when it comes to western comic book characters, either! Though you guys see my point by now. Manga is just a completely different culture, and when I read it I feel like I'm visiting some exotic place. Now if only I could just read all of it in the original Japanese instead of translated English... that would make it even sweeter! So you can expect a lot more manga reviews in this blog's future! I'm dying to read the next few installments of Mars, so hopefully I'll be able to find all the volumes at good prices. But if not, I have lots to read in the meantime! Will just have to try and tell myself that though, haha. How about you guys; do you read manga? What are your favourites?